John Betts of Colorado has authored several, beautiful books devoted to angling topics. His 1980 publication, Synthetic Flies, first brought him wide attention. Even Sports Illustrated highlighted the fly tying innovations represented in Synthetic Flies. In 1981, SI published an article on Betts, authored by Robert Boyle, titled “Gotcha! Hook, Line, and Lingerie” Since then, Betts has written about making split wood fly rods (note, bamboo, used in split cane rods, is a grass), hand-building fly reels, and more. What I admire most about Betts’ work is that his creativity extends beyond the topics of his books to the creation of the books themselves. He hand writes, rather than types, and personally illustrates each book. Moreover, the meanings of his words run much, much deeper than subjects at hand. Indeed, he writes poetically about tackle construction and other matters. 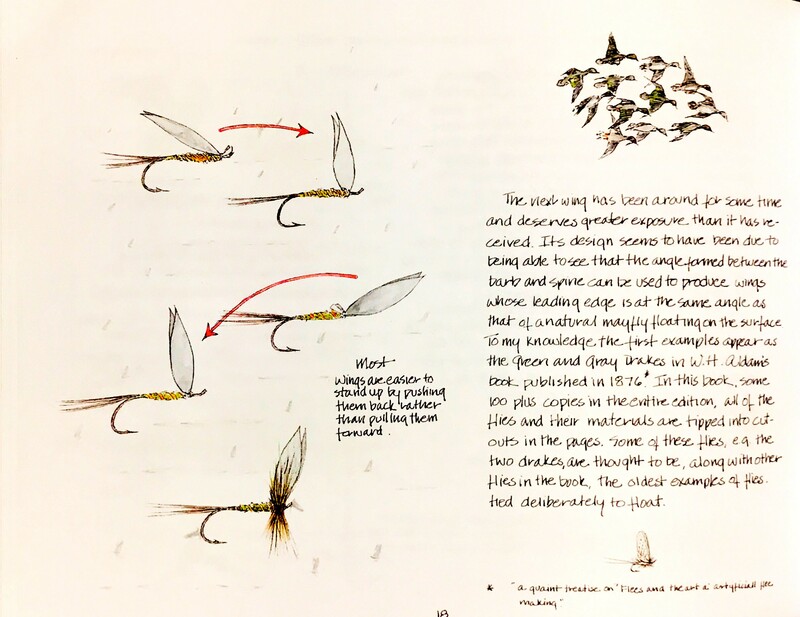 In recent years, Betts has worked with editor and publisher Michael Hackney, of Reel Lines Press and The Eclectic Angler (and initially in association with The Whitefish Press), to make his books–old and new–available. I purchased a copy of the latest Betts book, Patterns. Hackney writes of Betts’ texts, on the Reel Lines Press web page, that “each book is a work of art unto itself.” This is certainly true of this newest book. The content, writing, drawing, and paintings are wonderful. It is soft covered, and only 200 copies will be produced. 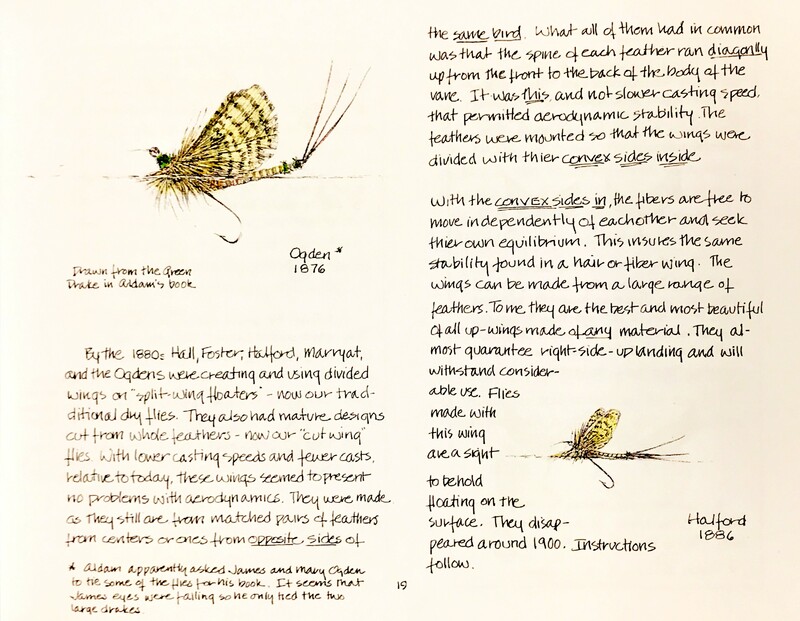 Even if you do not need a new fly tying book, which (on the surface) is primarily what Patterns is, you owe it to yourself to examine a Betts book. No doubt, he has already written about a topic that will appeal to you. Betts describes his creative process, including his use of a Rotring pen. Betts discusses Frederic Halford and other historical tyers, in Patterns. An example of Betts’ tying instructions, in Patterns. This entry was posted on June 8, 2018 at 4:07 PM and is filed under Fly Fishing Literature, Fly Fishing Tackle, The Arts. You can follow any responses to this entry through the RSS 2.0 feed. You can leave a response, or trackback from your own site.